An ascent on Baruntse (23,390ft / 7,129m) is an adventure for climbers wishing to summit a true Nepali peak. This remote expedition into the heart of the Khumbu culminates in a relatively short climb to the summit of this majestic 7,000er. Baruntse is among some of the highest peaks of the Himalaya , including Everest, Lhotse , Makalu and Ama Dablam, and this expedition rewards you with spectacular views throughout. After preparations in Kathmandu , we'll fly direct to Lukla and begin the trek into the Hinku Valley , enjoying Sherpa country at its finest. The hike-in provides for excellent acclimatization as we head northward through the pristine alpine environment. On the way to Baruntse BC , we will climb Mera peak 6654m, a height trekking peak in Nepal as acclimatized climbing trip. We'll establish Base Camp just above the Five Holy Lakes "Panch Pokhari" at 5,400m and one or two higher camps on the mountain. We'll ascend the 6,100m West Col before establishing Camp 1, where the long ridge leading to the summit is clearly visible. A tricky step at around 7,000m adds further spice to the climb. The route is generally a straightforward snow and ice climb and not technically demanding. On the way back, we will trek back via Amphu Lapcha pass – Namche, which gives you an interesting experience of Everest region. Day 39 Free day in KTM, Group celebration dinner. • Peak royalty, national park fees and govt. taxes. • 4 (four) nights hotel in Kathmandu on BB basis. • Domestic airfares and domestic airport tax. • Domestic cargo & excess baggages. • Cook(s) and necessary kitchen staff. • Required number of porter and yaks with herder. • All necessary climbing hardware gears with fixed ropes. • High Altitude Climbing Sherpa (One climbing Sherpa per two clients). • All food including available high altitude food for both trek and climb. • All necessary camping and kitchen gears for both trek and climb. • Best quality high altitude tents. • Oxygen with regulator set for medical purpose only. • Walkie-talkie set with radio base. • EPI gas with burner. 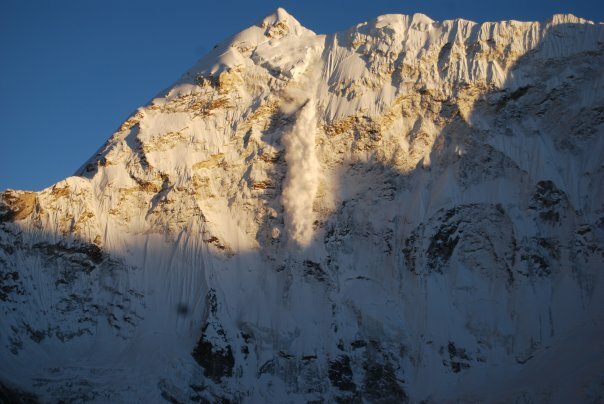 • Insurance of climbing Sherpa, local team members and Liaison officer. • Arrangement of necessary official documents. • All airport/hotel transfers. Celebration meal.